Curious about the new dwarf planet 2014 UZ224 ("DeeDee")? Check our our Fact Sheet! I am an Arthur F. Thurnau Professor in the Departments of Physics and Astronomy at the University of Michigan. 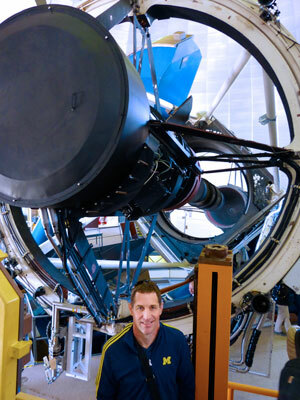 I'm an astrophysicist who uses the tools of optical astronomy to address one of the most alluring mysteries in science: the accelerating expansion of the universe. This expansion appears to be caused by a property of space itself called dark energy, which makes up nearly 75% of the energy in the universe. Dark energy earned its discoverers the 2011 Nobel Prize in Physics, but we actually know very little about it. Can dark energy be described by a cosmological constant, as Einstein proposed? Or does it depend on time, which would imply some new underlying dynamics? Maybe even general relativity itself needs to be modified. To address these questions, I'm working with an international team of scientists on the Dark Energy Survey (DES). We have built a new 570-Megapixel camera, DECam, to carry out a survey of 5000 square degrees (about one-eighth of the sk), using the 4-meter Blanco telescope at Cerro Tololo Inter-American Observatory in Chile. During 525 nights of observing between 2013-2018, DES will observe 300 million galaxies and discover about 4000 Type Ia supernovae. DECam, in essence, is a time machine that allows us to look over eight billion years into the past and observe how the universe has evolved to its present state. By making this "time lapse movie" of the past eight billion years of cosmic expansion, we'll learn how the tug-of-war between gravity and dark energy has shaped the growth large-scale structure in the universe. I'm especially interested in how this interplay has affected the properties of galaxy clusters. The same combination of area and depth that make the Dark Energy Survey a state-of-the-art cosmological survey also make it a powerful tool for understanding something much closer to home: our own Solar System. Because we observe the same areas of the sky repeatedly over several years, we can detect small, icy worlds beyond Neptune that can take hundreds or thousands of years to orbit the sun. These trans-Neptunian objects (TNOs) are preserved relics from the Solar System's formation era, and their properties today can tell us about the processes that shaped the Solar System long ago. The most distant TNOs could experience perturbations from massive, yet-undetected objects even further away, such as the recently-proposed Planet Nine. We are leading the search for TNOs with DES data, and have discovered dozens of new objects, including a possible dwarf planet nearly 100 times farther from the sun than earth is. Undergraduate students play important roles in this research.